An interesting city like Aceh should be a prime destination for spending holidays in Indonesia. Tourists have many reasons to visit it, after all. These include the natural tourism, historical trips, and religious tours. For those who are into pilgrimage or similar activities, Syiah Kuala Grave becomes a good reference, actually. Such sacred tomb resides in Meunasah Deyah Kuala Village and belongs to Banda Aceh City. It is the tomb of a famous person named Abdurrauf As Singkili who had a significant influence in spreading Island in Indonesia, especially Aceh. Today, the site has been visited by many people who want to pray and do pilgrimage. Due to lots of visitors, the tomb has been inaugurated as one of the most significant sites for conducting a religious tour in Aceh Province. In fact, it is about a hundred of people visit the tomb every day! These people have different reasons for visiting the site including sightseeing, conducting pilgrimage, praying, and others. Actually, the site does not feature only the grave of Syiah Kuala but also some other tombs. In some parts of the site, tourists would find a place for “Wudhu” or performing ablution before praying in the tomb. The first thing tourists notice when they arrive at Syiah Kuala Grave is definitely the sea of human! No wonder, people keep coming to the site either from nearby cities or other provinces. The fact is that foreigners are also seen there and they mostly come from Arab, Brunei, and Malaysia – Muslim countries. Visitors come to the site at different times as well including in the morning, at noon, and even in the evening! Most of them want to pray in the site while others spend some minutes to conduct photography. 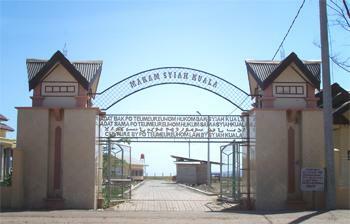 The next charm of Syiah Kuala Grave is the location, which resides near to a beach. That means visitors can enjoy two different attractions at the same area! The beach has a great view featuring small waves. However, the main charm remains the grave where people can perform pilgrimage and enjoy the peaceful nuance. It even provides them with an opportunity to meet other people and make some new friends. For foreigners, the visit provides them with a new experience by witnessing the locals doing their ritual. According to some people, the best time to visit Syiah Kuala Grave is at night. Why is that? It is the time when people perform a famous praying called “Dzikir”. Not to mention they would do a Sunnah prayer. Also, these people would visit nearby well and wash their face using the water. It is said the water is blessed and brings lucks to everyone. Not all people believe it, Even though not some have a doubt about it, tons of them have been doing it when they are at the site. The fact is that the tomb is located in Meunasah Deyah Kuala Village and it belongs to Pidie Regency. From Banda Aceh City, the trip takes approximately 3 hours and 30 minutes as the distance is 162 km. What about the route? They can simply take Lintas Sumatra Street.